Globe - also know as VP Globe or Panton Globe lives up to its name in full. Panton Globe is most of all a lighting object. When the lamp is lit in the evening it resembles a floating planet that gives off a soft glow of light. Panton Globe is made from a plastic globe that is split in the middle. Inside Panton Globe the insides hang on thin metal cords and consist of various reflectors as well as a cylinder in which the bulb sits so as not to give off any glare. The reflectors determine the dispersion of the light and are lacquered red, blue and chrome, which makes the colour of the light very comfortable to the eye. A lamp resembling Panton Globe is the Panto Lamp, in which the insides however look very different. While Panton Globe was developed in 1970 in connection with the furniture exhibition Visiona 2 in Germany, the Panto Lamp first came on the market in 1977. 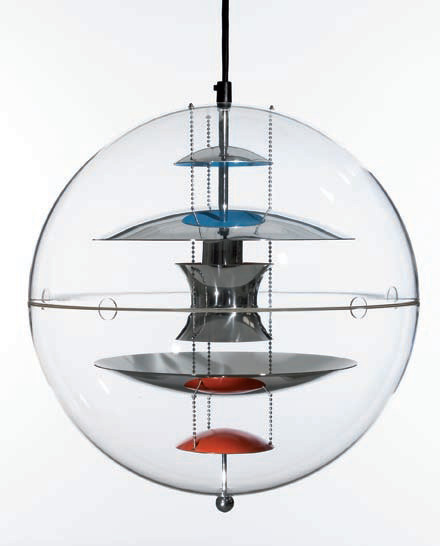 Panton Globe was produced in two sizes, 50 and 60 cm in diameter, while the Panto Lamp only came in 50 cm. Today both Panton Globe and the Panto Lamp have been put in production again and can be purchased new as well as used.